The colour of your teeth is influence by a number of factors. There is no one specific colour that a person's teeth should be. Some people's teeth are naturally lighter in colour than others. Your teeth will gradually become more stained and discoloured as you age, particularly if you drink wine, tea, cola or coffee, or smoke cigarettes. Some medicines such as the antibiotic tetracycline (and also the related compounds minocycline and doxycycline), can also contribute to tooth discolouration. Teeth whitening or teeth bleaching has become a popular option for you to maintain the whiteness of your smile. Your dentist will not be able to tell you exactly what degree of whitening you can ultimately achieve at the outset, but he will be able to give you a general idea based on his past experience. There are several treatments currently available that either your dentist can do for you, or you can do yourself at home. Here is a run down of the most popular. The most up to date practices in dental technology have come up with the development of teeth whitening products which use peroxide in a stable form. Your dentist will paint a teeth whitening gel onto your teeth and activate it using laser light. This treatment takes up to an hour and a half, depending on how much bleaching is needed. You may need more than one appointment for the best results. Many people prefer to whiten their teeth at home using a teeth whitening gel. 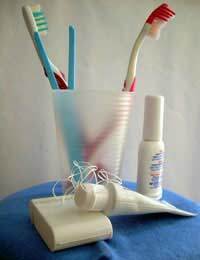 Most systems use a tray which is moulded to fit your teeth. You boil the tray for a few minutes so it will soften, and then bite on it for a few minutes. This enables it to conform to your mouth. The teeth whitening gel is poured into the tray and put in place. It has to be touching your teeth for 2 to 8 hours. The strongest whitening products contain carbamide peroxide, and can whiten teeth by several shades and remove tough stains. Whitening strips are coated with a peroxide-based whitening gel. The strips are usually applied once each day for 30 minutes for a period of up to two weeks. Initial results are seen in a few days and final results are sustained for about 4 months. All toothpastes are mildly abrasive so they will all help to remove and prevent surface stains to a small degree. Some whitening toothpastes contain chemicals that provide additional stain removal. Whitening toothpastes do not contain bleach so they can help remove surface stains only. Whitening toothpastes may lighten your teeth colour by only about one shade. Absorption of the chemicals can cause possible adverse effects. Changed in the surface structure of resin, metal and ceramic restorations. Changes in your bite position from extended use of trays.